Together with Fr. Boric and my colleague, Bill Baird, let me warmly welcome you to the Basilica of the National Shrine of the Assumption of Blessed Virgin Mary, the first cathedral in the United States of America. In 1806, the first bishop in the United States, John Carroll, laid the cornerstone and the structure itself was designed by Benjamin Henry Latrobe, the architect who designed, among other things, the U.S. Capitol. Ordained in this cathedral were bishops who were missioned to newly formed dioceses in many parts of the United States. Here the U.S. bishops met in a series of councils that were pivotal in organizing the Church in the United States in the 19th century. Indeed every November the U.S. Conference of Catholic Bishops meets in Baltimore, and the bishops gather in this historic house of worship for an opening Mass. This year, we will celebrate here the 100th anniversary of our episcopal conference. In 2006, William Cardinal Keeler restored this Basilica, capturing afresh the genius of Benjamin Latrobe who sought to be build a cathedral that captures the light and reflects the spirit of the United States of America. In 2011, however, a rare earthquake shook the mid-Atlantic region, causing significant structural damage to this newly restored basilica. I arrived in 2012, just in time to “re-restore” this venerable structure and discovered to my relief and delight that Cardinal Keeler had taken out an earthquake insurance policy! Ah, the Providence of God! As it happens, today’s reading from the Book of Ezra speaks of rebuilding an even more venerable place of worship, the Temple in Jerusalem. In the terrible days of the Babylonian Exile, the Temple had been desecrated and after decades of abuse, it was in ruins. Those returning from exile bitterly lamented this state of affairs and wondered if they would ever be able to rebuild it. Just then, God in his Providence, prompted Cyrus, the King of Persia, (who had become Israel’s benign ruler) to order the rebuilding of the Temple. He encouraged the people to make plans and to gather the necessary resources to build anew… a project that came to fruition only after much delay and struggle. As members of the DFMC, you are familiar with building projects of all kinds. For example, a number of new cathedrals have been built, as in the Diocese in Raleigh; new parish churches are under construction while others are being renovated, not to mention the construction, renovation, and expansion of parish halls and schools; and some of you are dealing with restoring church buildings after natural disasters. You deal with a host of life and safety issues in churches and allied structures along with a range of financial, legal, and regulatory matters, so necessary to sustain not only our structures but indeed the Church’s mission as it is lived out in parishes, schools, and ministries of service. Indeed, you have the unalloyed joy of dealing with deferred maintenance, a euphemism really, for buildings that are in not much better condition than the Temple after the Babylonian Exile! Probably more than anyone else in the life of the Church, you know what a complex process it is to build and to sustain. The story of the rebuilding of the Temple portends a great truth about the Church, and it’s this: the Church is always in need of being re-built. Such lessons always sound better in the Latin language, so here it is: “Ecclesia semper reformanda est” – the Church is always to be reformed. Its people, its mission, its structures, its sources of sustenance are always in need of being reformed, rebuilt, and renewed – history marches on and we can never remain stationary in a fixed point of time. And while, as fiscal managers, you have significant concern for the financial and managerial health of your dioceses, you really labor at the heart of the Church’s need to be renewed and replenished, day by day, week by week, year after year. Yours it is to help marshal and invest the Church’s resources and to help deploy them effectively for mission. Yours it is to help dioceses, parishes, and a host of ministries sustain themselves. And like the people of Israel, we in this country are no strangers to risks and calamities that threaten to lay waste the Church we love. 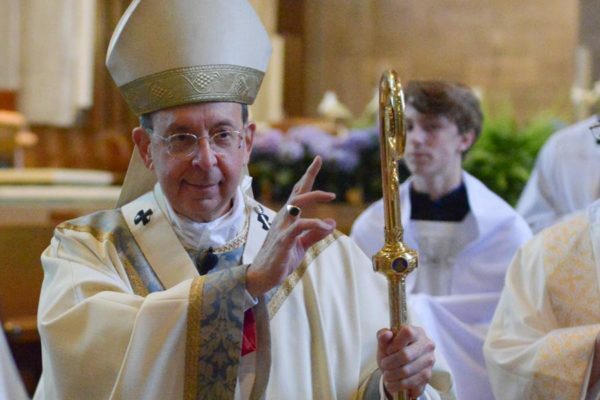 You are called, then, not merely to manage a department but to work with your bishops and your entire diocesan family of faith in rebuilding the house of the Lord, his household of faith, in your dioceses. Dear friends, allow me to approach these same lessons from another architectural perspective, and it’s this: as the hours of this day wane, the windows in the large dome above us capture the light of the setting sun. They were cleverly designed to do so by Latrobe with the help of none other than Thomas Jefferson; he seems to have had an abiding interest in the construction of domes. Thus the architecture of this building offers us another way of looking at your mission, consistent with today’s Gospel where Jesus tells us not to hide his light but to allow it to shine brightly in our midst. I would submit that, as you labor to achieve financial transparency, and seek to promote in church management the highest ethical standards, you are helping the Church to reflect the light of Christ in the world. You are helping the Church to bear witness to that critical difference that comes with being a follower of Christ and a member of his Body, the Church. And while such work is often less than glamorous, it is vitally important – for unless we live out the Lord’s teaching internally, we are hampered from proclaiming it externally – to a skeptical world. Jesus’ final words to us this night seem to imply a divine law of economics: “To anyone who has, more will be given and from the one who has not, even what he seems to have will be taken away.” Yet, these words of Jesus do not refer either to our charts of accounts or to our investment portfolios. Instead they refer to the capacity of our hearts to hear the Word of God. The more we listen to God’s Word, the greater our capacity to hear Him. The less we listen, the smaller our capacity to hear the Lord’s voice becomes. Thus, to the extent that we invest in a life of faith and prayer, we will see our work, even when it is difficult, as a ministry of service – and thus a source of spiritual growth. When we fail to invest in a life of faith and prayer, we may summon all the powers God gave us and apply them diligently to our work – yet the spiritual dimension of what we do will evaporate and vanish. May we, in the celebration of this Eucharist, find the never-failing resource upon which to build our lives of faith and upon which to build the house of the Lord. May God bless us and keep us in his love!